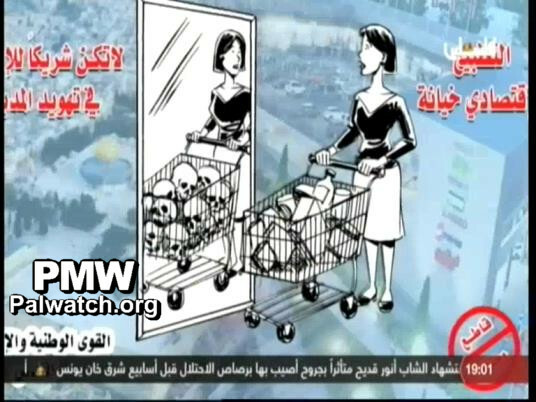 Text upper right: "Economic normalization is treason"
Palestinian Media Watch has documented numerous times that PA and Fatah leaders prohibit what they call "normalization with the enemy." For example, in the name of Islam the PA's Fatwa council prohibited Palestinians to seek election or vote in the Jerusalem municipal elections, and Fatah called on Arabs in Jerusalem not to participate in municipal elections - and succeeded, as only 1.5% of Jerusalem Arabs voted. The PA's intelligence service arrested a man for inviting an Israeli MP to his home, and his family denounced him. Likewise, PA TV programs for kids have encouraged children to boycott Israeli products and Palestinian institutions have condemned participation in joint Palestinian-Israeli arts festival in Jerusalem. Fatah condemned Indonesian religious scholars who participated in a conference in Israel and said they had "sold their souls to the Devil." In 2014, senior PA leader Jibril Rajoub condemned a joint sports event between Palestinian and Israeli children as "a crime against humanity."